The best way to get to Andech’s Monastery is to park at the bottom of the hill it tops and walk the 6 kms through fields and meadows and up into the forest. As we did this I noticed most people carrying with them what appeared to be bags of salad. Our hosts, Hanno and Annette, had assured us that there was a fabulous beer garden at the top that also served meals…why would people be bringing their own salad? And what was in that bag than Hanno was swinging? Salad? All was revealed at the top. Once we had settle in with our pints of Doppelbock, and we were munching on pretzels (OMG…what I wouldn’t do for an authentic German pretzel! 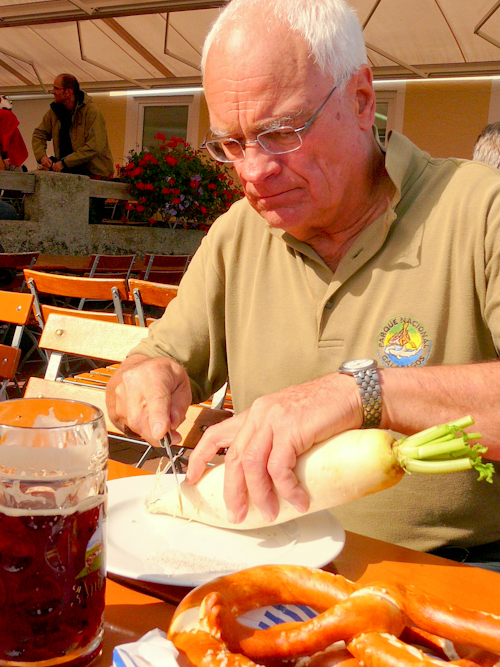 ),Hanno pulled a German beer radish out of the bag that he had so carefully toted up the mountain. He proceeded to cut it in a very particular way – first in one direction and then precisely in another direction so that a ‘radish accordion’ was created. Carefully, he poured salt in the cuts and left it to rest. In time, our radish began to ‘weep’ and was declared ready to eat. We pulled it apart and enjoyed every salty bite. My new favorite; beer, radish and pretzel. Must. Remember. Not. To. Read. Whilst. Hungry. Sounds like it tasted amazing! That combo is a new one for me.